Interpolate a simple profile between two points. 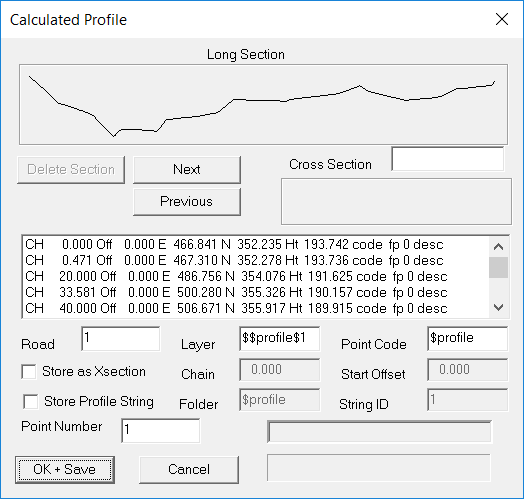 Interpolate a profile through a number of points. Interpolate a profile along a string. Interpolate profiles and sections along a string. In this tutorial we are going to do some more work on the data we used in the boundary tutorial, so after you start up CDS you should Open Job "BDY" in the Foresoft\cds2\tutor folder, and then Maximise the window showing Job BDY. At this stage you should see a screen like the one below. Your client is a city solicitor who has bought this property with a view to building a country retreat, and she wishes to establish a site for a home in the general area of Point 139 .You need to determine a suitable access road to this area from the Main Road that runs from Point 203 up to Point 239. For your first task, you need to get some idea of the profile along the frontage to the main road so you can determine a likely driveway. Since you only need a general picture to start with, you can achieve this easily by interpolating a simple profile. You should pull down the Contour menu and highlight Interpolate, and you will be presented with a list of options as seen in the screen below. If you select the option titled Simple Profile, you will see that the Status bar prompts you to "Use mouse to click in two points for the profile"
All that is required for a simple profile is the two end points, so you should position your cursor near Point 203 and press the left mouse button. Now move your cursor up and place it over Point 239, and again press the left mouse button. You will have noticed that a line was drawn showing where the profile would be taken as you moved the cursor, and once you selected the second end point, the profile is calculated instantly and displayed as seen in the screen at right. You can see the general lie of the land from the profile shown in the graphic window, and you can also look at the values shown in the window below. Here you see that if you wish to provide the client with an access with the best possible view of traffic on the main road you should start the access at the high point which is around point 241. (And yes I know you might have worked that out from the point heights, but you wouldn't have learnt what a simple profile does if you just did that). If you wish, in your own jobs, you may store away these interpolated points by assigning a Road Number, and a layer and code if applicable, and then pressing the OK+Save button. Here we have no need of saving the information, so press cancel and move on. Now your client has told you that the local fire authority require her to provide a firebreak along the boundaries of her block, and she thinks that she may be able to use her access road as a firebreak. To achieve this she would like to see the feasibility of a road parallel to the southern boundary. As a first look at the possibility of this scenario, you should look at a profile starting near Point 241, running across to the boundary near Point 229, and then following around roughly parallel to the boundary until you get around near the proposed house site near Point 139. You should pull down the Contour Menu, highlight the Interpolate option and select Multi Profile. You will see the status bar tells you to "Use mouse to click in points for profile, Press Enter to finish". What this means in more common English is that you should “sketch” where you want the profile taken by moving your cursor around the screen and “clicking in” a point wherever you want the profile to change direction. Then, when you have completed your “sketch”, you press the Enter key on the keyboard to indicate to the program that no more points will be supplied. Note that a Multi Profile is made up of straight lines only, and if you need curves to define your profile you should calculate the required alignment points, add them to a string and use the String Profile option. So, following this cryptic instruction, put your cursor over Point 241 and press the left mouse button. Now move the cursor across to near Point 229 and again press the left button. You will see the line drawn to show where the profile will be taken. Now, you can simply "click in points" to keep the profile line roughly parallel to the boundary as seen in the screen at right. Remember, the principle application of this option is for a quick preliminary profile, so we are not interested in millimetre accuracy at this stage. Once you have 'sketched' the position of the profile and positioned the cursor over Point 139 you should press the Enter key to terminate the multi profile. 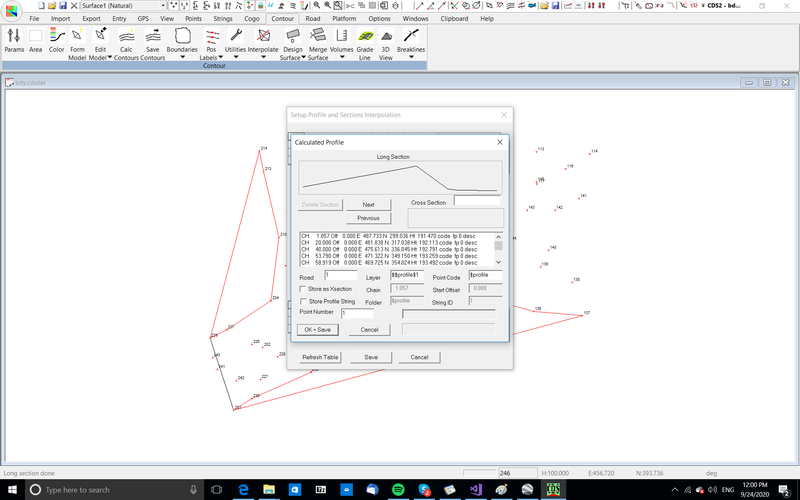 The program will now calculate the interpolated points for you, and display them as seen in the screen at right. If you examine the graphic representation of the profile, you will see that apart from a creek crossing near the main road, there doesn't appear to be any major impediment to taking an access road around this route. While no grades are shown at this stage, you can if you wish scroll down through the values shown in the table, and do quick mental 'sums' from the chainages and heights shown and you will find that there are no particularly large grades to be found. 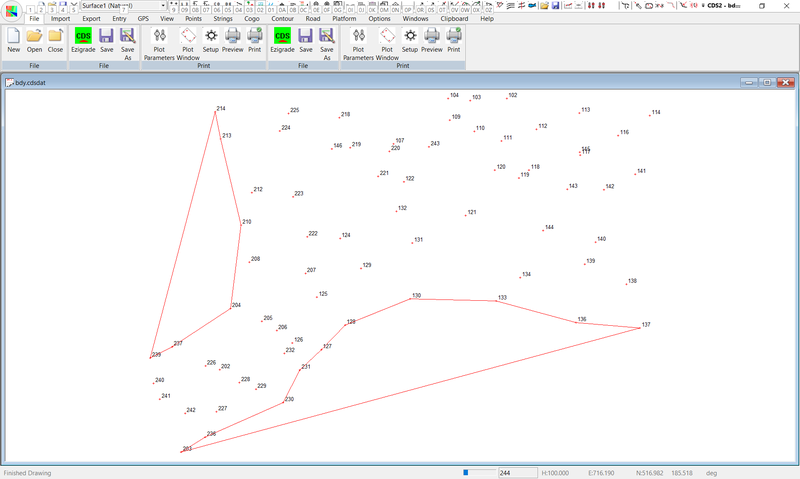 If you wished, you could store away this profile by assigning it a Road Number and a Start Point ( and possibly a layer and point code ) and then plot it out, however, since it is only a first look we will not save it in this exercise. Now that we have established that there is no major impediment to a road along this southern boundary, we should try and establish a proposed route for the road a little more precisely than simply sketching as we have done. Your client has advised that she would like to have the road "about 20 metres off the fence", so we have determined some bearings and distances for you to use to calculate the position of the centre of the road. We hope that in this location the road will also satisfy the firebreak requirements. Once your points have all been calculated, you need to create a string to define the preliminary centreline of the road. You can either point to the points with the cursor, or type in a string definition which will be 241, 300.305,139. Note here that we have used the expression 300.305 to indicate a sequence of points starting at 300 and counting by one to get to 305. If you are clicking points in with the cursor, you would need to select 300,301,302,303,304,305.Once you press Apply and then Finish, the string will appear as seen above. You need to select the string or strings you wish to use to interpolate a profile. In this case we only have one string, so pull down the Strings menu, highlight the Select Strings option and then choose Single String Selection. Position the cursor over the string you have created, and select it. 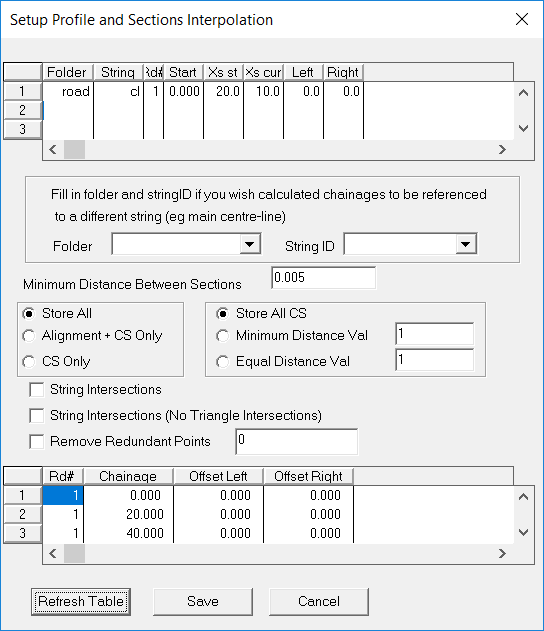 Once the string has been selected, pull down the Contour menu and highlight the Interpolate option, and this time select the option tilted String Profile. The screen will appear as seen at the bottom of page 6. You will see that a default Road Number of 1 has been set and that is OK.
At this point in time, select the button at the bottom of the screen titled ‘Refresh Table’, and you will see the table now appears as seen below. This indicates that you will interpolate a level at even 20 metre intervals, as well as at the points you have included in the string. This is more than adequate for this stage of the investigation, so select the Save button, and the screen will appear as below. If you wished to save only the profile away, you could do so at this point, however we won't bother at this stage. Since we are vaguely satisfied with this location, we will go on and take some sections to go with the profile, and store them all at the one time. 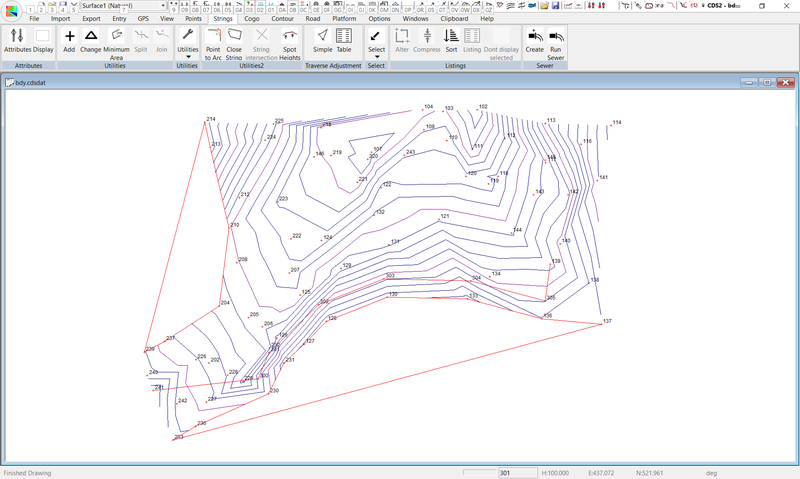 You will need to select the centreline string once more before you proceed with interpolation of the profiles and sections. 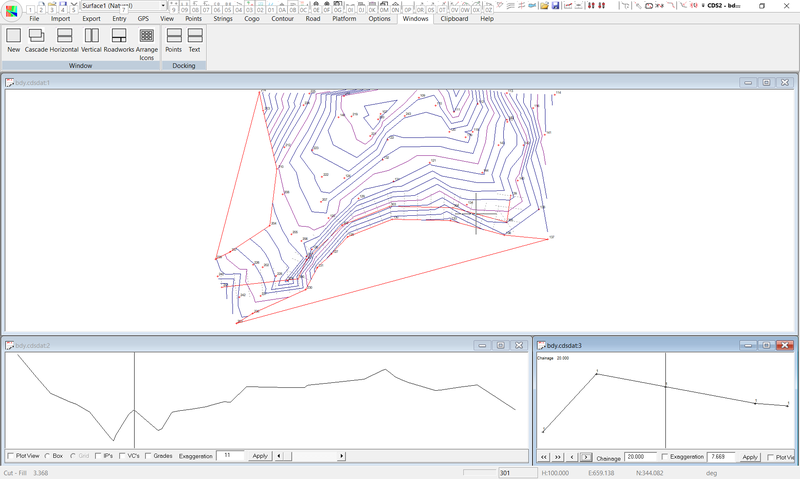 Once the string is selected, pull down the Contour menu, highlight Interpolate, and select Profiles and Sections. You will find a screen appears which is remarkably similar to the one you saw when you selected String Profile. Once you select the “Refresh Table” button, you will see that the screen appears as seen below. Note that if you wish to have different width sections interpolated, you can simply change the values for Left and Right. The sections do not need to be symmetrical, so you might wish to have sections that extend 15 metres on the left and 10 metres on the right.You may also specify a different interval to interpolate sections at if you wish by changing the value in the Fields titled ‘Xs st’ (sectio0n on a straight) & ‘Xs Crv’(sections on a curve). Please make a mental note for future reference that you can have sections interpolated at different intervals on strights and on curves by using these fields. When you select Save, the sections will be calculated, and the screen will appear as at right. This time you will see that a cross section is displayed, as well as the profile, and you can use the Next & Previous buttons to move backwards and forwards through the cross sections to inspect what has been interpolated. Once you are satisfied that the sections are all vaguely satisfactory, you should press the OK+Save key, and the Points will be stored away in the job. They are stored in a separate table. This way they don't interfere with our original data points but are available for plotting and road design etc. 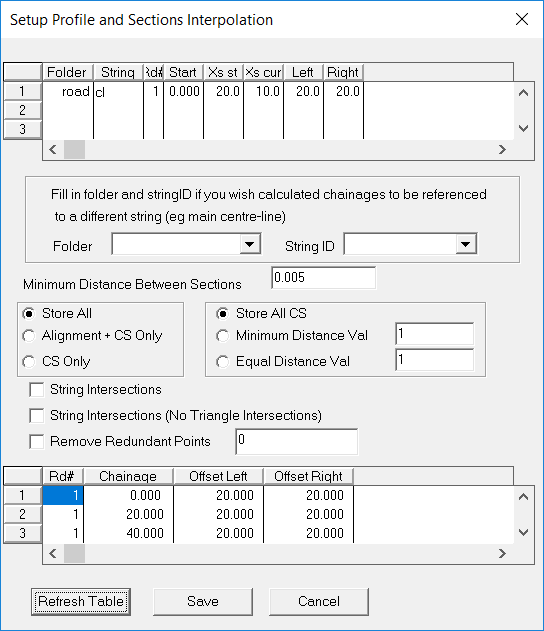 If you then Cancel the table screen to return to the job, the points have been saved in a database table seperate from the original data points.If you wish, you can now pull down the Road menu and proceed to plot out details of this road using the techniques that you learnt in Tutorial 5. To get started, pull down Road, select Display and Plotting and select Display Profile. You will see the profile drawn. Again pull down Road, select Display and Plotting and this time select Display Sections. You will see the first cross section drawn in a new window. Now pull down the Window menu and select Tile Roadworks to obtain a screen like that below. 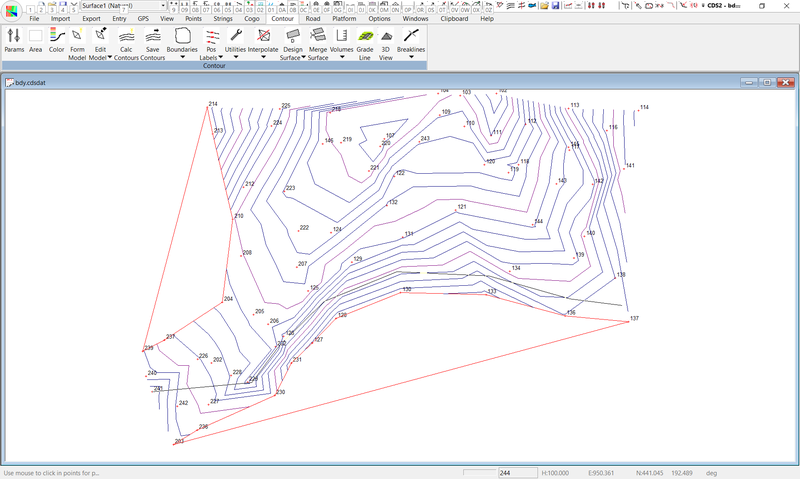 Here you see the plan view of the job showing sections in plan view, together with your Profile and Section. Refer to Tutorial 5 to reinforce how you apply the techniques you learnt there and how to achieve a plot of both profile and sections.